strengthen relationships with their clients, promote their business and increase overall revenue. 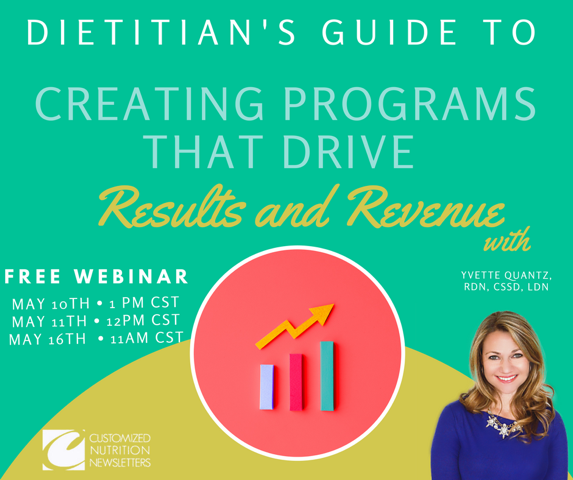 The one-hour webinar scheduled to go live on May 10 and 11 will have Yvette, the co-founder of the Acadiana Nutrition Group inspiring you as nutrition specialist to create a program in your practice to build your brand image while increasing the overall revenue. Dieticians today are keen to learn how to promote their private practice, but are not sure where to begin. Besides, in their busy schedules, they are hard pressed on time to create compelling content. You will walk away feeling inspired and empowered to create your own program with effortless ease. You will also learn to use the predesigned program REFINE – A comprehensive done-for-you 10-Week Online Nutrition Coaching Program that offers a complete plan, weekly lessons, emails and more to help boost your nutrition practice. Once you register, you will get a free download of the playbook that you can use to fill out during the webinar.